If it is ever 1977 again, I'm going to use these amps. My son found them at a nearby house with a 'help yourself' sign next to them. It would have been rude not to take them! Speaker outputs on male XLR. Input unbalanced on XLR. Power input is also on XLR (but a version intended for high voltage) There is a big fan on the back but if they are rack mounted, gaps will need to be left above and below as the only other ventilation is in the top and bottom panels. My DIY amp built in early '70s used 8ea 2n3773 per channel making 250W at 8 ohms... So perhaps they are talking about 2x400W at 4 ohms? PS: Slow but robust power devices. My amp still worked last time I turned it on. Used to have a Studiomaster board. Whatever became of that company? I used to use that exact same input configuration for my speakers. The XLRs handle more current and are easy to extend-just like mic cables. That was when the company made good products. A couple of decades ago they were making crap-using the same name. Not sure if it was the same company. 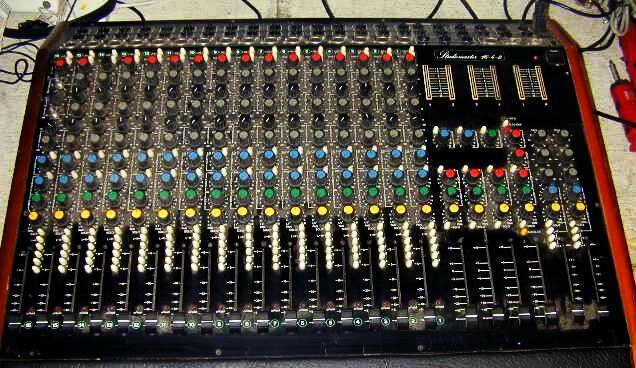 My first large format console was a StudioMixer II. It was supposedly designed by one of the engineers that formed Studiomaster. It was 32x8 and almost 8' wide. You can see it in this photo in the middle. Very heavy and also hard to get a decent mix on. My 24x4 biamp and Kelsey mixers were much easier to mix on-even though they had a wimpier eq section. I also hated the way the channels (on the studiomasters) were labeled backwards. But I assume that was done so that when they were expanded (you simply mounted blocks of additional channels to the main console) they would be correctly numbered. I also hated the way the channels (on the studiomasters) were labeled backwards. That actually made sense to me. Why do we (generally) start at the channels the furthest away from the master fadeers? Obviously, they are just numbers and made no difference to the actual way we did things. I read from left to right. And if you were to ask anybody to list the numbers 1-24, they would start on the left and go to the right. Agreed it is just numbers-and we usually put tape over them anyway.